For centuries, teachers have used emojis as a tool for self-expression; to clarify and add flair to their written languages. Emojis, if you’re unfamiliar, are pictures used in texting and other electronic messages. The face emojis represent a wide, complex range of emotions, much like the range of emotions found on the yearly—sometimes even daily—teaching journey. One minute you get a visit from a dyslexic former student telling you he just got his Ivy League acceptance letter, the next you sit through a meeting that leaves you wanting to stab plastic sporks into your eyeballs. 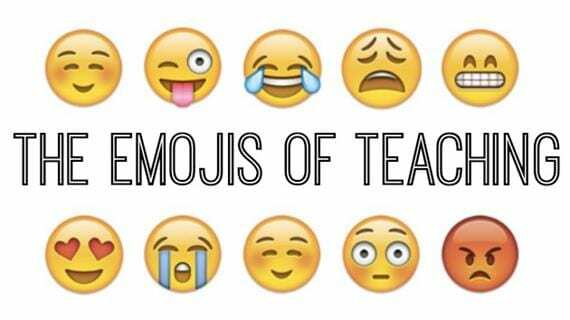 Luckily for us, we have emojis to help us identify, process and express our emotional situations no matter where we find ourselves on the great roller coaster of teaching. Here are just a few. Oh, sweet letter/drawing/fingerpainting from student! TEACHING FOREVER! DONUTS IN THE TEACHER’S LOUNGE! Responded to the Action Required email immediately instead of procrastinating! Microsoft Word Document Recovery, I love you. The first year of teaching. Burned tongue on microwaved lunch again. Ahhh, diligent, cooperative, on-task children! Eleven out of 35 students turned in homework. Eleven. Looked at credit card statement during back-to-school. Fell out of rolling chair in front of class. Again. School choir sings touching song at concert. Total goner. School AC goes out in June. Too crazy to be mad. Active monitoring during standardized testing=water boarding. Someone informs you halfway through your Thursday that it’s actually Wednesday. Forgot hat for outside duty in January. Vending machine ate Diet Coke money. Thinking about problematic education policies for too long. Returned to a perfect report from the substitute. Weeknights at 7:40 during DEVOLSON. Former student comes back to visit and is 3 feet taller. One too many education buzzwords used indiscriminately/incorrectly during a meeting. Student ends up loving unit she originally told you she hated. What does this emoji say to you about teaching? Sleeping? Sad and drooling? A snot bubble? I couldn’t pinpoint it. Love, Teach teaches English at a Title I middle school and writes about it at http://www.loveteachblog.com. In addition to teaching, she enjoys carbohydrates, old stone walls and thinking about life as a series of interlocking gears. Love, Teach teaches English at the middle school level and writes about it occasionally at loveteachblog.com but mostly on Facebook. She is a big fan of her dog, school supplies, and weather that is under a million degrees. Best of Teacher Helpline: How Can I Teach Close Reading to My Struggling Readers?